And, quickly now, we’re on to the second Bob Dylan music video. 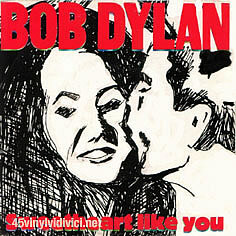 Also from Infidels, “Sweetheart Like You” is the closest thing that Dylan has had to a top forty hit in thirty years! This one peaked at #55 on the American pop charts, and he has not had even a top 100 chart hit since then. Remarkable, really. This is a disputed song. Some see it as an allegory (apparently for the church: “They say in your father’s house, there’s many mansions / Each one of them got a fireproof floor”), others see it as misogynist (“You know, a woman like you should be at home / That’s where you belong”). If it’s an allegory, it’s not a particularly sharp one; if it’s sexist, well, he’s sung a lot worse than this one. The song does a few good lines: “In order to deal in this game, got to make the queen disappear / It’s done with a flick of the wrist”, but that’s about it. It’s a fine song, but not one of the great ones. Now, the video. On the plus side, it’s better than that for “Jokerman”, but, of course, few things aren’t. It also seems pretty typical for the period, with the band playing in an empty club, watched only by a stoic old woman with a mop. The first minute or so of the video dwells on her impassive expression in the face of this kind of mediocre Dylan performance – she’s not exactly selling this as the work of an icon. The video holds off on showing us Dylan in close-up for almost a minute and half, and then, BAM!, my word: those bangs! Dylan’s beard here is a bit of a mess, but his hair – what has he done to his hair!? The 80s really were a horrible moment in the history of coiffure! The band, of course, is mostly not the band from Infidels. I don’t know who the blonde woman playing the guitar solo is but it is definitely not Mick Taylor. A bunch of attractive people straight out of central casting. 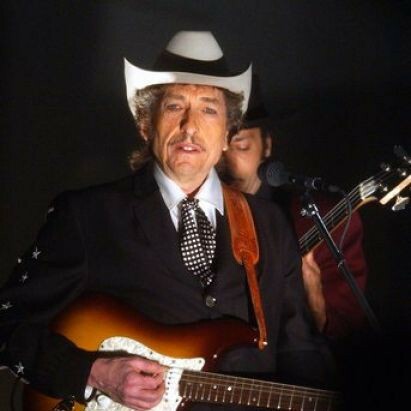 So, there’s not much to this – a lot of chiaroscuro lighting and a non-plussed woman staring at Dylan’s bangs. At least things are improving, ever so slightly, on the video production front! Honestly bart, your gender analysis is always your weakest link.